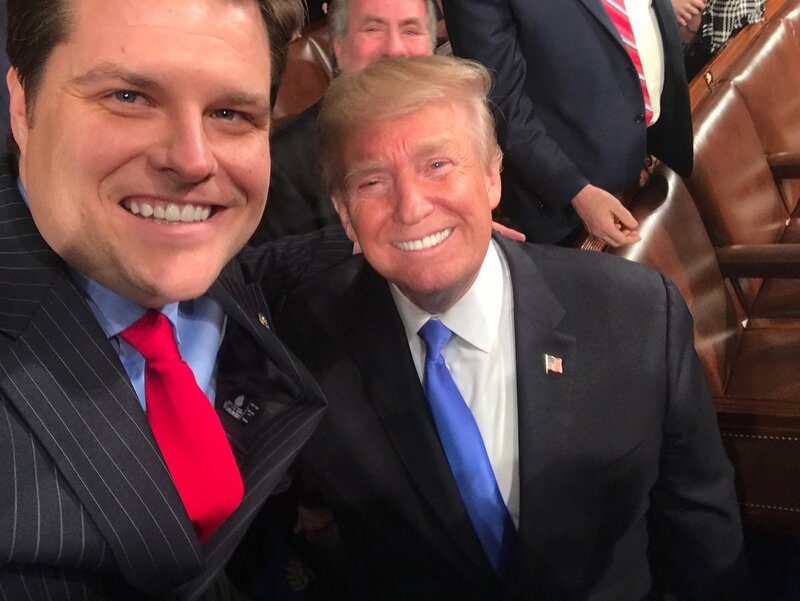 Photo: Matt Gaetz and Donald Trump in happier times, via the congressman's Twitter. The Florida Bar is investigating Republican congressman Matt Gaetz one day after he tweeted a threat at Donald Trump's former lawyer Michael Cohen. Cohen is testifying before Congress today. Separately, Rep. Gerry Connolly (D-VA) says the tweet by Gaetz (R-FL) should be referred to the Justice Department, so prosecutors may examine whether the notorious Trump supporter's tweet was foul play or witness tampering. On Tuesday night, just hours before Cohen's public testimony before the House Oversight Committee taking place today, Gaetz tweeted at Cohen, "Do your wife & father-in-law know about your girlfriends? Maybe tonight would be a good time for that chat. I wonder if she'll remain faithful when you're in prison. She's about to learn a lot..."
Gaetz later deleted the tweet and apologized. The Florida Bar Association is investigating Rep. Matt Gaetz for his Michael Cohen tweet, and one potential result could be that he loses his license to practice law in the state. The Florida Bar on Wednesday said they would send Gaetz a letter outlining the allegation against him. Gaetz will have 15 days to respond. The Daily Beast first reported the investigation.